Discover personal stories from a handful of our successful graduates, finding out how their degrees have provided them with industry skills and shaped their career paths. Seyed Mirian graduated in 2018. 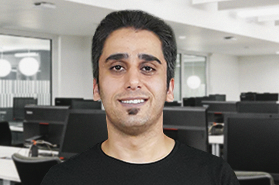 Seyed told us what it was like to study with us and how university encouraged his passion for computer science.